Programs in the marine industry are only getting more complex. This eBook provides guidance in terms of strategies, processes and enabling technologies to successfully execute programs. What are Enterprise Business Platforms, Solutions and Apps? 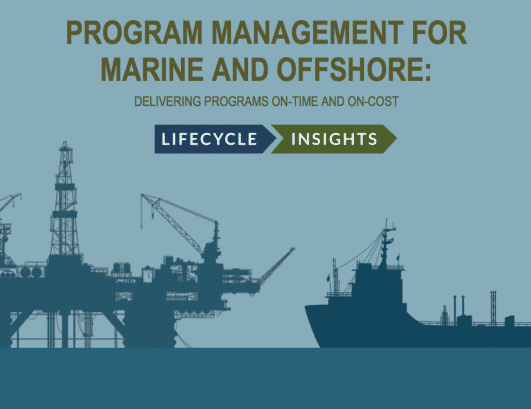 This eBook is of most value to Program Managers in companies serving the Marine and Offshore industry, as it focuses on the specific trends and needs of those roles in that industry. Specifically, this eBook is helpful for Program Managers in the process of transitioning from a reactive role to a proactive one. Running a shipyard has never been easy. Yet today, it is only getting harder. It all starts, of course, with winning orders. To compete for programs, every bidder has to get aggressive: both in terms of schedule and costs. Once won, delivering on those constraints is no easy task. Late delivery translates into stiff financial penalties, cutting into already thin margins. In addition to those constraints, the complexity of marine and offshore programs is only growing. Vessels and platforms are increasing in size and value. The ecosystem of suppliers is becoming more globally distributed. Environmental regulations and safety standards are getting more stringent. It simply is a reality for today’s shipyards; every single order is a strenuous endeavor. Despite all of these issues, shipyards have to deliver on time and on budget, or profitability, reliability, reputation and competitiveness significantly suffers. That of course, is where modern Program Management comes in. Program Managers track and manage all aspects of the program, from the owner’s requirements to the design office to sea. They identify critical issues early and pull in the right personnel across the ecosystem to resolve it. They understand the impact of a potential change across all domains. They smoothly guide the program through difficult transitions. They do all this to avoid devastating delays and cost overruns. Their efforts to accomplish these tasks are mightily undermined today due to a variety of reasons.